If home life feels like a constant battle to deal with The Stuff That’s Basically Everywhere, you’re in good company. Perhaps you’ve tried to get your house organized without success. Or maybe you just plain don’t know where to start. Let me say this: You can declutter. It will take time, but it is possible. 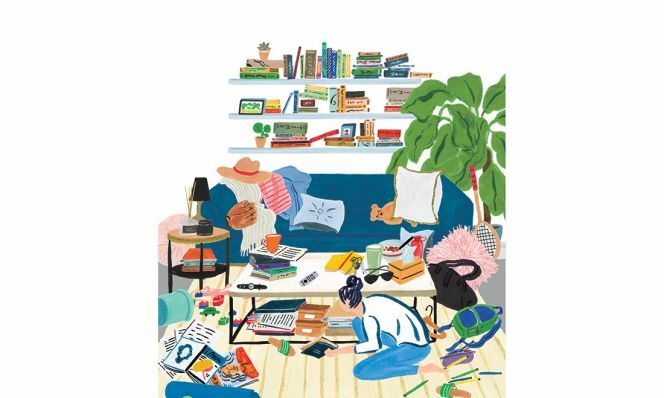 The first step is to conquer decluttering paralysis. Your feet may feel heavy, but with each step they will get lighter. First up: my 31-Day Detox Challenge, below. It really is doable! 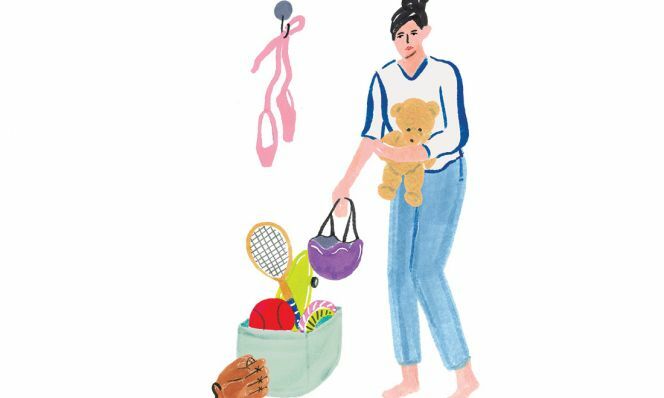 But before you’re finally able to let go of excess stuff, you’ll likely need to deal with some emotional baggage. In other words, you have to think about the why of your personal decluttering paralysis before you can move past it. We all have plenty of excuses for holding on to things. You may have your own unique ones, but I’m sure at least some of mine will sound familiar. Armed with a basic understanding of my decluttering principles and workarounds for common excuses, it’s time to get going! Just as a detox diet helps eliminate toxins from your body, this 31-day home detox helps you clear stuff out of your space. The plan is designed to jump-start your decluttering and target the obvious. You likely won’t get down to deep clutter, but it will hopefully drive your motivation to keep going with the room-by-room approach in my book. GOAL Quickie purge to get the declutter party started! TIME COMMITMENT 15 minutes per day. YOU WILL NEED Garbage bags and boxes/bins/shopping bags for anything you want to donate. Consider this plan a guideline, not gospel. Know that there are catch-up days built in to allow for extra time in particularly jam-packed areas. Skip spots that aren’t relevant to your life. Customize it to work best for you! Are there piles on the kitchen counter or in your home office? Go through bills, receipts and any other papers, tossing (or shredding) what you don’t need and filing what’s left in its proper place. “Our attention is our most valuable asset,” says Lusita, author of The Right Fit Formula. “Where we focus our attention is where our effort goes. So if we’re focusing on stacks of paperwork that never get sorted, that can lead to a lot of stress and a cluttered brain.” Reclaiming a counter eliminates that frustration and brings back your focus. Pack up for donation any coats, shoes or accessories that are no longer used. Put any out-of-season finds into storage. the next.” It’s mental energy you don’t want to waste. Remove random stuff you don’t reach for regularly. Cut down on unnecessary multiples like pens, mini notepads or half-full packs of tissues and gum. Stash makeup and other small essentials in a zipper pouch that can easily be transferred from purse to purse as needed. Go through all products (wherever they may be lurking in the house!) and discard any you don’t use. If you have multiple partially filled bottles of the same exact product, combine them into one. Toss any beat-up rags and sponges, they only harbor bacteria. Toss anything that has expired or you know you won’t use. Toss anything that has expired or you know you won’t use. Don’t forget to go through the spices too. This is a catch-up day if you didn’t finish any of the above areas. If you’re all caught up, pick the most cluttered area in your home and spend 15 minutes picking through there. Scour the shelves for anything you don’t use. Ensure that all plastic storage containers have matching lids. Eliminate unnecessary gadgets and utensils. Evaluate all medications for any that are expired or no longer needed. Return expired meds to your local pharmacy for proper disposal. Find maintainable storage solutions for all items that frequently land on the table and commit to keeping it clutter-free. Donate any dishes, serving ware or other items you don’t use. Make sure all DVDs and CDs are in their proper cases and think about what you really will use. Videos and music are so easily accessible through our computers and mobile devices that all those CDs and DVDs may not be necessary. Cut out magazine pages you’d like to keep, and scan them to save digitally or sort into a folder or binder. Recycle or donate old books that you’ll no longer read, and keep the rest in a logical order. Get rid of any not-needed items. If there’s still time, use small plastic containers to group similar items together. Put away anything that belongs elsewhere. See instructions for Day 7. File away any needed paperwork and shred remaining papers. Sort smaller office supplies and keep only what you use. Get rid of those 2014 calendars! Go through all accumulated beauty, bath and nail products and keep only what you really use day-to-day. Donate any linens that you no longer use but are still in good condition. Toss anything holey or dingy. Toss anything that is expired, cracked or no longer your style. Pick your favorite lipsticks and toss the other dozen you never actually wear. Sort through everything and keep what you wear for everyday or on special occasions. Donate or ditch the rest! If any keepers need cleaning or repairs, vow to take care of that as soon as you can. About each and every piece of clothing, ask yourself whether you would buy it again today. If not, out it goes! Make sure socks have mates and keep only what you still wear. Clear off the tabletop and sort through drawers, keeping only what you would need before bed or during the night. This is always a fun one. Sort through old toys and games to see if there are any special keepers. Make sure toys have all their parts and are in working order before donating or selling. Toss the rest! Donate anything outgrown or sort into a labeled storage bin if you’re saving for younger cousins. Be ruthless! Really evaluate what you will use. Schools will often take the rest. 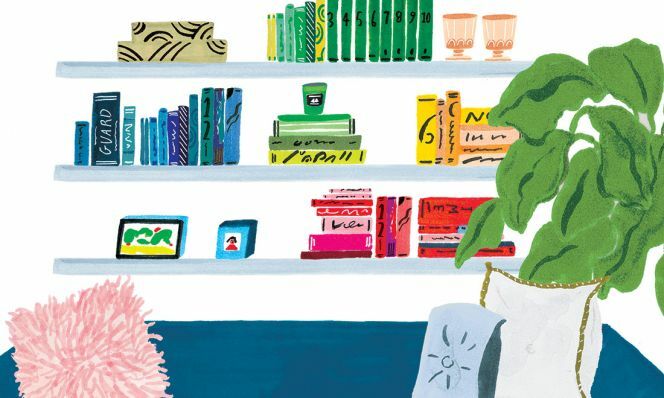 Let spaces you’re physically decluttering make way for spaces you can mentally declutter in—and that doesn’t always mean sitting cross-legged with your eyes closed. “If someone’s involved in a craft project they get lost in, for example, that’s a moving meditation for them,” explains Katz, author of the forthcoming One Minute to Zen. It might be the kitchen counter space you’ve cleared that allows you to enjoy cooking or the garage space you’ve organized so you can work out down there. “Other activities can be a meditative experience, as long as you’re centered and present while doing them,” says Katz. Sort through cupboards for any products you won’t use. Toss any random socks that are hanging around. Hello, clutter catchall. Set a timer and try to get rid of as many items as possible. Use large storage totes to store seasonal items together. For major clean-up tasks you might need a little distraction, especially if the sight of your mess leads to stress. “I’m really big on getting into your other senses besides sight. It’s such an easy trigger,” says Lusita. After all, clutter stresses you a whole lot less when it’s behind a closed door. Light a candle with a scent you love, put on a comfy outfit or blast your favorite music. This space also tends to become a giant clutter magnet. Just like when you tackled the basement, set a timer and collect as many items as you can that you no longer use or need. Yes, even the car goes under the clutter microscope because stuff accumulates. Grab two bags—one for garbage and the other for anything that needs to go back inside. Put anything you bring back into the house where it belongs. Pace yourself. You don’t want to burn out before you cross the finish line. Sleep on it. Then re-evaluate anything you were on the fence about. After some zzz’s, it will be easier to let so-so stuff go. Is selling this likely to be worth my time? Your time is limited, and you should use it wisely. Take into account how much money you can (realistically!) expect to make from a sale versus the value of your time spent. I think of it in terms of an hourly rate. For example, if I’m trying to sell an item for $5 and I estimate it will take 30 minutes to take photos, list the item online, answer emails from potential buyers and close a deal, that makes my rate $10 per hour. Set a minimum rate for yourself and stick to it. There are so many selling forums, it really is a buyer’s market. If there are already a hundred similar items listed, you’re going to have to settle for less cash. Do I have a realistic expectation as to what I might make? to look at items that have actually sold and for how much, because there are tons of things on there that never sell. Set a time line and stick to it. If the item isn’t sold by the designated date, you need to give it away. Can I group like items into one lot? Selling similar items together, such as kitchenware or clothing in a certain size, will save time and energy. You may net a little less, but it’s easier to unload multiples at once. Bottom line: The main goal of decluttering is to actually get rid of what you no longer need or use. If you can turn some of your clutter into cash, great. If not, let stuff go. Maybe you spent a lot of money on something but never really used it. Perhaps it was a gift and you don’t want to hurt the giver’s feelings. No matter the reason, keeping that item in the back of your closet won’t help you feel better. In fact, it will probably make you feel worse. Get rid of both the thing and the guilt. You’ll feel lighter when you let go! We’re bombarded by images of organized spaces that are color coordinated and perfectly styled. We collect those ideas and wait for the day when we magically have extra time and money to throw at creating that just-so space. Don’t wait for someday. Get started NOW. Do the best you can and be proud of what you’re able to accomplish today. Do you have a closet filled with ignored scrapbooking supplies or a garage full of abandoned sports equipment? Maybe you think that you should want to be someone who has shelves of lovingly made scrapbooks or devotes hours to playing tennis or golf to stay fit. Remind yourself that warehousing things that just highlight what you’re not doing won’t help you be happier. It probably has the reverse effect and makes you feel bad about yourself. Figure out what you really want to do with your leisure time and let no-longer-needed stuff go! This is a biggie. Giving away things that we no longer use but feel personally attached to can be hard. I admit that I’ve even shed a few tears as I gave away some of my kids’ toys, but I can honestly say that I’ve never regretted it. It was just a brief moment of sad as I let go of the past so I could be able to embrace the future. Remember that you’re just letting go of the item—not the person or the memories. I’m not saying that you have to give away everything—you can always keep a few favorite treasures if you have the space. The key is to make sure you contain it—as in, set a limit of one box or tote and stick to it. Chances are if you haven’t used an item in the past year, you’ll probably never use it again. And once you’ve gotten rid of it, you probably won’t think of it again. On the very off chance that you do need some kitchen gadget you’ve cast off, you can probably borrow one from a friend. Very similar to “I might need it” but more negative. Think jeans that would be wearable if you’d just lose 20 pounds. Those jeans are dragging you down. Get rid of them. If you do lose 20 pounds, you deserve a little shopping spree! Let’s face it: We all have a finite amount of both. Starting to declutter is more about emotionally committing to the process rather than finding the guaranteed time to do it. Whether you choose to spend an hour once a week or 15 minutes per day, it doesn’t matter. Any time you devote to decluttering moves you one step closer to getting it done. Set a realistic goal for what you can fit into your week and commit. Remember that this process will actually free up time in the long run because you won’t be managing unnecessary stuff anymore. Why Should You Declutter Your Mind? You don’t need a cluttered space to have a cluttered mind—but sometimes that’s where it all starts. And, unfortunately, there are physical consequences to the visual messages being sent to your brain when you look at stacks of mail that need to be sorted through, dishes piled up in the sink, shoes that were kicked off and abandoned, and bags that need to be put away.Here’s how less-busy environments (and brains) can impact your body. 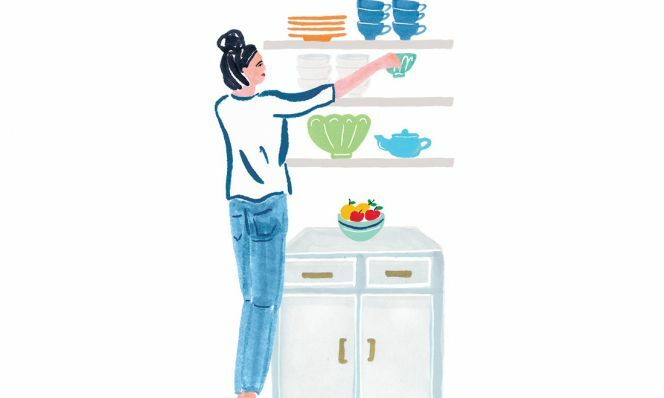 One study showed that people eat twice as many snacks when they’re in a disorganized and messy kitchen as compared to a clean, decluttered one. That stack of clothes to donate in the hallway. What’s for dinner. Why your kid’s room smells so funky. The call you forgot to make about the credit card bill. When you catch yourself in a cyclone of thoughts, ask yourself these questions to quiet the storm. “Stop and check in with reality,” says Shojai. You’ve got to notice what’s happening (“I’m stressing myself out!”) before you can change it to what you’d like it to be (“I’m getting calmer and more focused”). Are these thoughts allowing me to be the best version of myself? How can I be fully present? Stop Multitasking. When you’re overwhelmed, it’s best to focus on a single task at hand rather than flitting among all the things that have to happen today. You’ll be more efficient and calm. Refocus. Concentrate on what’s in your power to control right now, like the recyclables piling up in your house—not how you want to find a prettier bin to put them in. Sometimes there are just too many to-dos racing around your brain. When that happens, your mind can’t differentiate between which are important and which can wait, explains Soukup, who recommends doing something she calls a brain dump. “Get all of your to-do list out of your brain and onto a piece of paper in 10 minutes or less,” she says. “I find it helpful to set a timer.” Then prioritize each task with a different number (no ties) and focus on tackling the top 20% of your list—that’s what will make the biggest impact. If you go into a day thinking, “I don’t know how I’ll get it all done,” you’ll feel defeated. So stop for a moment and map it all out. “It unclutters my mind,” says Soukup, creator of the Living Well Planner, who maps out her upcoming week every Friday afternoon. She recommends giving yourself twice as much time as you think you’ll need for tasks and building in unstructured time to, say, call a friend. “Things go from feeing impossible to me knowing that it’s doable,” says Soukup. The thinking behind Jennifer Lifford’s 31-day home detox is to set you up to successfully start decluttering and make you see enough of a difference that you want to keep going. 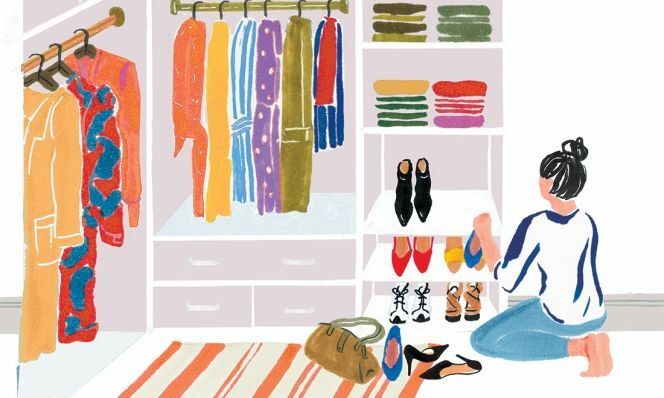 Her book offers a much deeper dive, with comprehensive room-by-room clean-out advice, plus guidance on establishing better overall habits so you don’t end up back where you started. As a lifelong yo-yo dieter, I found the weight loss analogies she makes—as in, when she writes about “Shedding Pounds” of clutter and “Maintaining a Healthy Weight” when it comes to stuff—relatable and helpful. Watch out, random crap in my house: I’m coming for you.